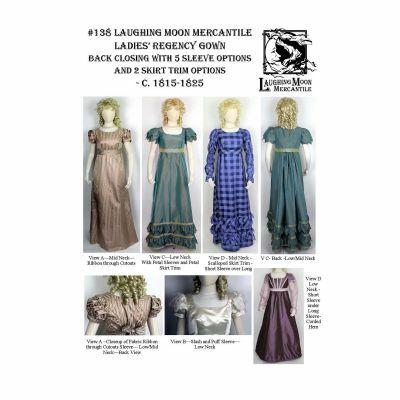 LM138 - 1815-1825 Ladies' Regency Gown Pattern - Back Closing with 5 Sleeve Options Pattern by Laughing Moon Mercantile. 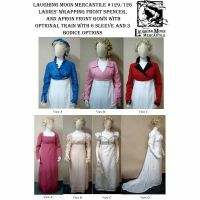 There are instructions if the maker wishes to change the neckline to one of their own design. Views A and B use a short sleeve with optional cutouts. View A uses the cutout short sleeve with either aribbon made from fabric, or a purchased ribbon, woven through the cutouts. View B has gathered puffs protruding from the cutouts resembling slash and puff (or pouf) Renaissance style sleeves. View C uses a double layer petal edge short sleeve, with both layers having a faced edge. View D uses the short sleeve without cutouts paired with the long sleeve which can be layered either over or under the short sleeve. 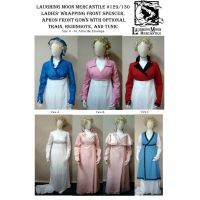 The long sleeve can be gathered in at the wrist alone or at several places on the arm. The gown has a separate belt which can be omitted or replaced with a purchased ribbon sash. The skirt has front, side back, and back pieces. The back of the skirt attaches to the bodice with 6 pleats on each side, with the center 2 pleats forming a box pleat. The skirt is the same length all the way around. 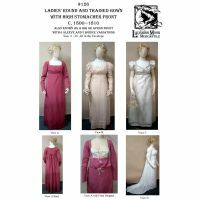 The bodice in all views is formed with a front, side, and back pieces. 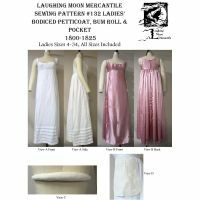 The back of the bodice can close with an overlap, or as in some period examples, can close so that the center backs just meet. 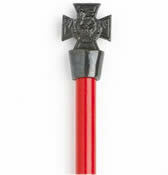 Optional piping can be added to seams, belt, and bands, and instructions for creating piping are included. The neckline is finished with bias binding, which may or may not be piped as desired. The skirt can be left plain or elaborately trimmed. There are also instructions for finishing the bottom of the hem with wide cording if desired. There are yardages and instructions for the two types of skirt trim shown on View C and D, both petal (zig zag) and scalloped trim. 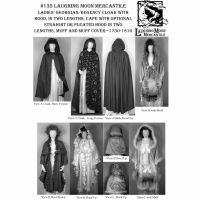 Fabric: Cotton, Linen, Wool, or Silk. Drapey fabric is not recommended. Plain, figured, striped, checked, velvet or velveteen. Thick fabric will complicate the double sleeves. Lining: Cotton muslin. The skirt is not lined. Interfacing: Hair canvas or medium linen. Notions: Plain cotton kitchen twine for piping, or piping can be bought premade. Cording for the bottom of the skirt -4 Yards of 3/8 inch. Cotton Filler Cord. Ribbon trim for View B Sleeves-4 yards of 1" wide ribbon or1/2 yard fabric. Closures: Buttons, hooks and eyes, or ribbon or tape bows as desired. 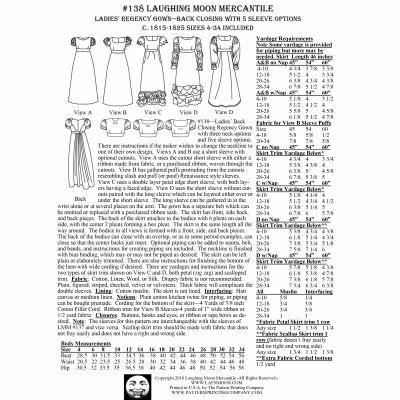 Note: The sleeves for this pattern are interchangeable with the sleeves of LM137 and vice versa. Scallop skirt trim should be made with fabric that doesnot fray easily and does not have a right and wrong side.